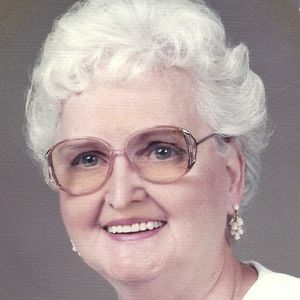 Evelyn Elizabeth Pyzik 91, passed away after an extended illness. Peg, as she was known to her family and friends, was born in, Pocahontas, Arkansas on July 11, 1927. She was born the eighth of nine children to Frank and Cecelia Frangenberg. Peg married Edward J. Pyzik on Sept 5, 1945 and together they moved to Anderson and raised their family. She was a member of St. Mary's Church and St. Ambrose Church most recently. She was a talented seamstress and enjoyed sewing clothes, quilts, Raggedy Ann & Andy dolls for all her family and friends. Peg volunteered with her sister Jean Brown at St. John's Hospital sewing baby blankets and crocheting newborn hats for several years. grandchildren, Jill Spears, Susan (Seth) VanDeVen, Johnny Spears, Liz, Josh and Jake. In heaven Peg will be reunited with her husband of 67 years, Ed; her parents; siblings, Pete Frangenberg, Marie Krebs, Jo Nettles, Zita Casey, Kate Lavelle, Anna Lampkins, Jean Brown, Barbara Potor. Many thanks to Community Northview and Countryside Nursing Home staff who cared for Peg these past few months. A special thanks to the St. Vincent Hospice Nurse Pam, who provided such loving care and kindness to our dear mother, grandmother and great grandmother. We are eternally grateful. Memorial Contributions may be given to the donor's choice of charity.